XINDELL Car Laptop Stand is a little table/ desk that attaches to your steering wheel or back seat and provides you with a writing area, laptop desk, and breakfast table while waiting in your car. For safety reasons, never use this product while driving. Convenience for my kids to eat and do their homework on the way to school! It is very adjustable and customized for different heights and reaches and angles. This tray has an extension that slides out the right side. It's perfect for mouse or cell phone etc. The tray slides up and down and has a brace underneath that is adjustable for just about any configuration you can imagine. It has hooks that can hook onto your steering wheel or they can be put in a different location to attach to the back of a seat. 1.Wide range of uses: for most models of cars. 2.The side increase the new drawer-type mouse tray. 3.Can be folded, folded after the thickness of the table is less than 3cm, do not take up interior space. 4.The key parts of this product is folding site. Unique folding, but also make the product installed simply, easy to use. 5.Suitable for car travel, business office, leisure, but also very suitable for travel with their own car. It is driving out business, tourism, leisure essential supplies. 6.Easy to place items on the table, can serve as a computer desk, dining table. Can also be written on the table, taking notes, widely use, apply to any style of car. 12 Months Worry-free and 30 Days Money-back Product Guarantee for Every Purchase from XINDELL. We offer high-quality products and best service. If you have any problems about the products, please tell us and we will offer a satisfied solution for you. ✔Multipurpose Car Laptop Stand: It can easily hold your laptop tablet or iPad. Plus It's a most convenient and practical tray with multifunctional uses; a quick snack, breakfast tray, kids meals, coffee holder and more. ✔Car 14inch Laptop and Food Steering Wheel Desk is Easy to Mount: Simply hook the tray to your steering wheel and you've got an instant ergonomic desk. It also stores conveniently. It's allowed it to fit in the back seat pocket of your vehicle. The stand is adjustable for different heights and reaches and angles. ✔Apply to: Ideal for car travel, business office, relax purposes, but also very suitable for traveling with their own car, especially families with children. The essential supplies for people driving out for business, tourism, and relax. 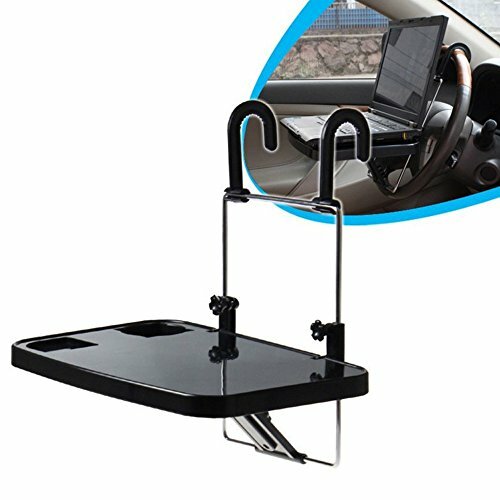 ✔High Quality Car Laptop Table: Fashionably designed out of high quality premium material the Car Laptop and Food Steering Wheel Tray is strong, durable and long lasting. ❤100% Satisfaction Guarantee: If the Car Laptop Stand make you dissatisfied or have any quality problems, just contact us by email, we would replace any defective products for our customers. If you have any questions about this product by X XINDELL, contact us by completing and submitting the form below. If you are looking for a specif part number, please include it with your message.